'To Care For Him': Female Veterans Ask VA To Include Them In Its Motto The VA motto, which is taken from Lincoln's second inaugural speech, addresses veterans with the male pronoun. Some veterans want to change the wording to include women. Veterans gather at the site of the 1776 Battle of Fort Washington in Manhattan. They are calling on the VA to rename the Manhattan VA Medical Center in honor of Margaret Corbin, who took her husband's place during the battle after he was killed. On a recent chilly day in Manhattan, a group of veterans marched a dozen miles up the island — from the historic Fraunces Tavern to the spot where the first woman pensioned by the United States Army fired her cannon at British redcoats. Her name was Margaret Corbin — and now there's a bill in Congress to name the Manhattan VA for her. It's part of another movement, to change the motto of the Department of Veterans Affairs so that it reflects that women do — and have always — served in the armed forces. "There is no better or more appropriate veteran to name the Manhattan VA after than Margaret Corbin," said Kristen Rouse, a three-tour Afghanistan Army veteran. Rouse organized the Nov. 16 "ruck-march" in Corbin's honor, 242 years to the day after her heroic actions. When Corbin's husband John volunteered to fight the British, Margaret became a "camp-follower" — one of the many family members who cooked and tended to troops in George Washington's rebel army. John Corbin was part of the force assigned to defend New York harbor from the commanding heights of what's now Fort Tryon Park in Manhattan — in what became known as the Battle of Fort Washington. The Americans were vastly outnumbered by attacking British redcoats and Hessian mercenaries on that day in 1776. The small artillery company was ordered to hold off the Hessians. When John was killed, Margaret stepped in to take her husband's place, fighting until the position was overrun. "And witnesses later attested that Margaret's gun was the last to fall silent on Forest Hill. And only after she'd been struck by three musket balls and mangled by grapeshot. Leaving severe wounds in her jaw and chest and nearly severing her left arm," said Rouse, "It's an astonishing story that Americans need to know." Making Manhattan's 23rd Street VA Medical Center the first in the country to bear the name of a female soldier would help do that. But what happened to Corbin after the war is just as significant. Corbin was given half a male soldiers' pension. She never recovered from her wounds, living out her days near West Point, known as a hard-drinking woman who preferred the company of other vets. Maybe not a model VA success story, but a familiar one. Corbin's remains are interred in the West Point cemetery. "...to care for him who shall have borne the battle and for his widow, and his orphan." It's from Abraham Lincoln's second inaugural address, delivered in the closing days of the Civil War. Advocates want to change the motto to, "...and for 'their' widow, and 'their' orphan" — to reference both male and female vets. The current VA secretary, Robert Wilkie, says he's proud of the way the U.S. military and the VA have changed to include women. But he's not comfortable changing Lincoln's words — he'd rather stress the new services available to female vets. "Because when they walk in to a veterans hospital and there's a women's clinic for the first time in our history that acknowledges on the part of the Veterans Affairs Department that the world has changed," Wilkie told NPR in a recent interview. "But I can't remove the words of one of the greatest Americans in history because without him there is no Veterans Affairs Department. " Krisen Rouse says she's not trying to change Lincoln's words – just the motto. "When you walk into the Manhattan VA, I can't tell you where the women's clinic is, but I can tell you where the motto is," Rouse says. "And I can tell you the spots where people have questioned whether I'm a veteran or not." Rouse says that happens every time she goes to the VA. 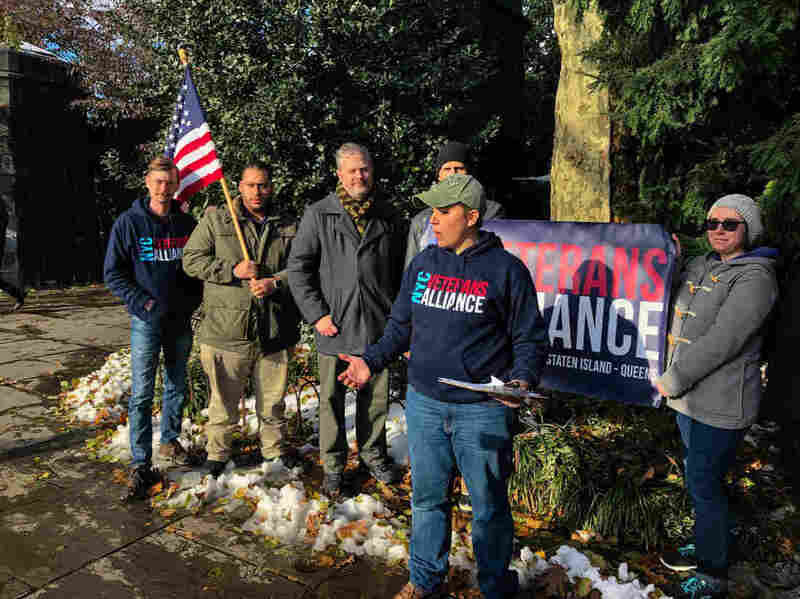 The motto change is supported by several groups representing post Sept. 11 veterans — and there is now a bipartisan bill to do so moving through Congress. One of its sponsors is another Afghanistan vet, Republican Rep. Brian Mast of Florida. "There's no doubt that female veterans face unique challenges and healthcare needs that the VA has not yet been able to successfully address," Mast told NPR in a statement. "Fixing this critical failure starts at the top and changing the mission statement is a needed first step." A VA spokesperson said the department has no position on the bill, but without comment forwarded an op-ed from the military news website Task and Purpose, which points out that changing the motto would probably cost millions of dollars.